The protagonist is Percy Jackson, who discovers that he is the son of Poseidon, god of the sea and earthquakes. He learns that the legendary beings of Greek mythology still exist and have always existed, including monsters, cyclopes, empousai, Titans, and also the Olympians (Greek gods) themselves who dwell in Olympus which is now situated at the mythical 600th floor of the Empire State Building. He is frequently attacked by monsters because he is a child of one of the "Big Three" (Zeus, Poseidon, and Hades). 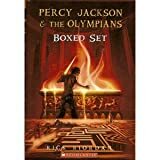 Percy meets many other young demigods, both friendly and hostile, who are also in the process of discovering their heritage and powers. As of 9 February 2010 (2010 -02-09), the series has been on the New York Times Best Seller list for children's books for 134 weeks.